These sweet, crispy Lemonade Rice Krispies Treats are the same classic favorite kids love but with a lemonade twist. They’re thick, gooey and chewy, just what you want from your Rice Krispies Treats, and oh so easy to make. Add in some Easter sprinkles and candy and you have the perfect holiday snack. Rice Krispies Treats have been a classic kids favorite for generations. They’re easy to make and the kids and big kids too never get tired of that gooey, chewy sweet flavor. 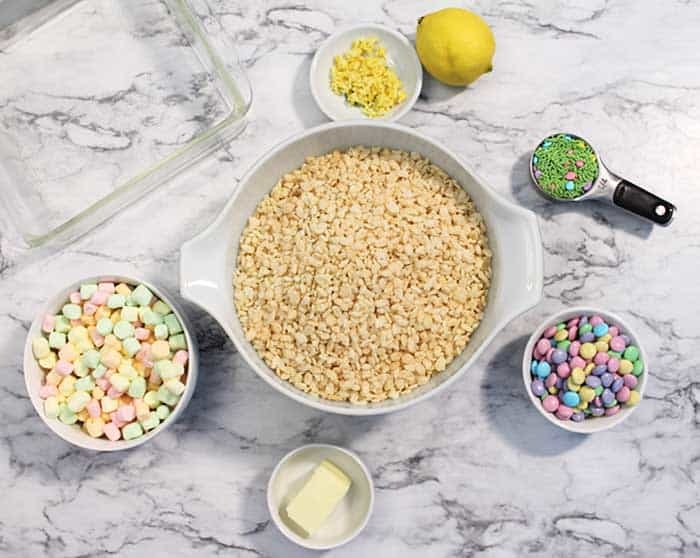 These treats have a simple list of ingredients, most of which you probably have on hand, including Rice Krispies cereal, butter, lemon juice and mini marshmallows. 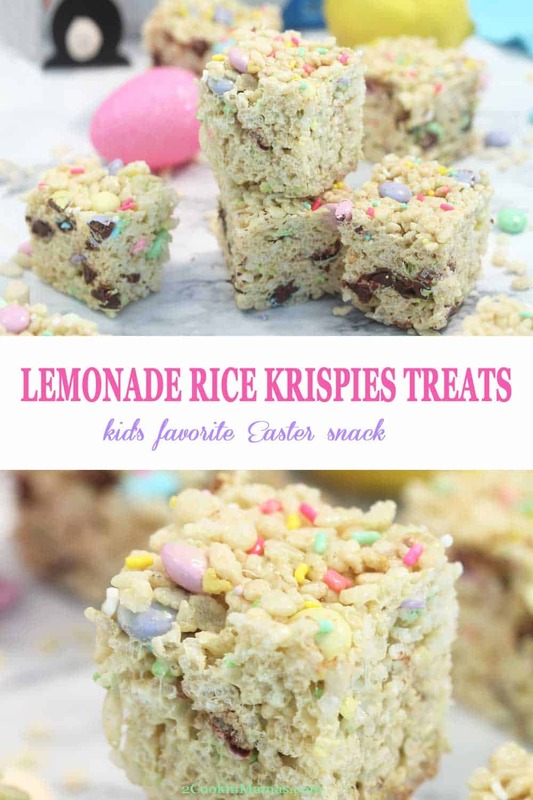 There’s a little twist to these treats, as you may have guessed by the name, Lemonade Rice Krispies Treats. Yep, there’s lemon juice and zest added to the mix! It gives these treats an extra layer of flavor that reminds me of springtime lemonade. And that bright, crispy taste pairs perfectly with the crackly cereal, sweet marshmallows and candy. 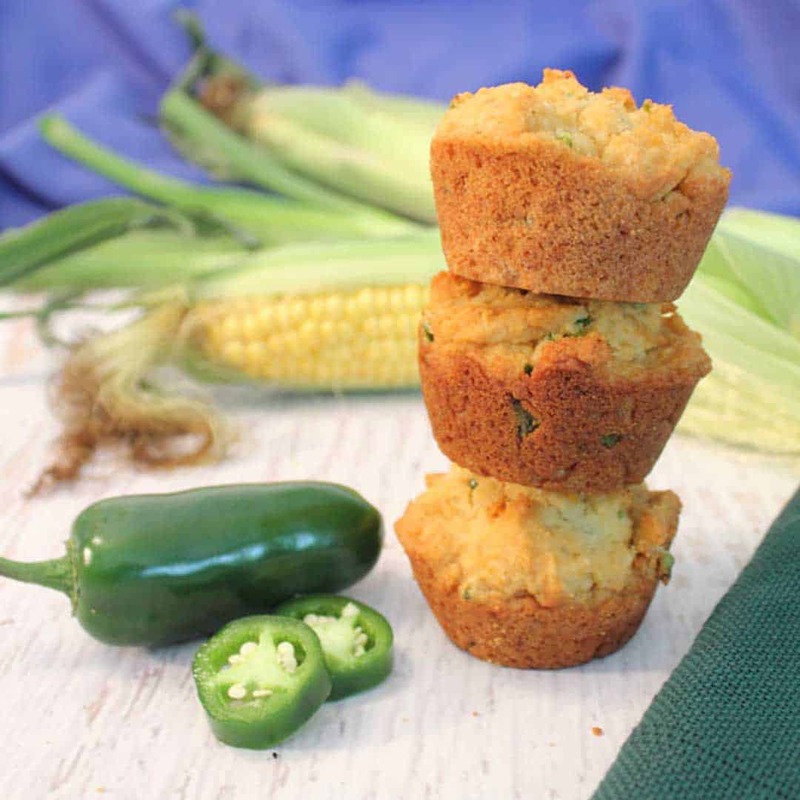 With Spring here and Easter around the corner, it’s easy to make this tasty snack into a special holiday one for Easter. 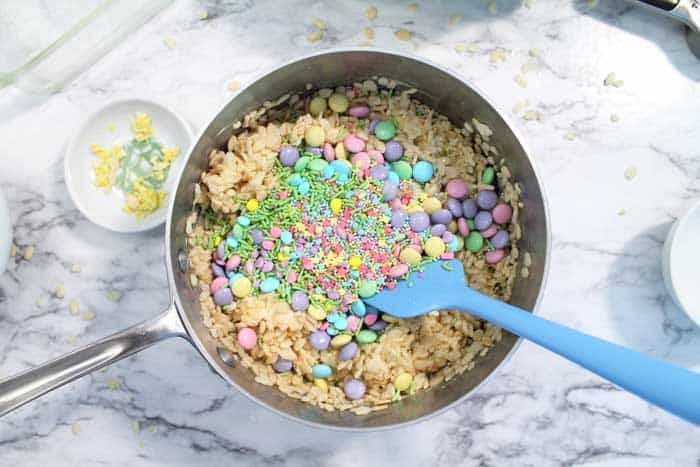 Just add your kids’ favorite Easter candies, like pastel colored M&Ms, and a few colorful spring sprinkles and you’re all set. You can even let the kids stir them into the melted marshmallow mixture and watch their eyes light up. Once the candies are all mixed in, let the kids finish them by patting them into the pan. Then the hard part begins…. waiting for them to cool before gobbling them up. How long do Rice Krispies Treats last? They will keep well for 2-3 days in a resealable bag on the counter or up to 6 weeks in the freezer. Why are my rice krispies treats hard? The butter and marshmallows need to be cooked over a low heat and melted to prevent them drying out. It may take a little longer but the result will be crisper lighter treats. Why didn’t my butter-marshmallow mixture melt well? Make sure you are using fresh marshmallows. Old marshmallows will tend to form one big clump instead of a nice smooth creamy mixture. 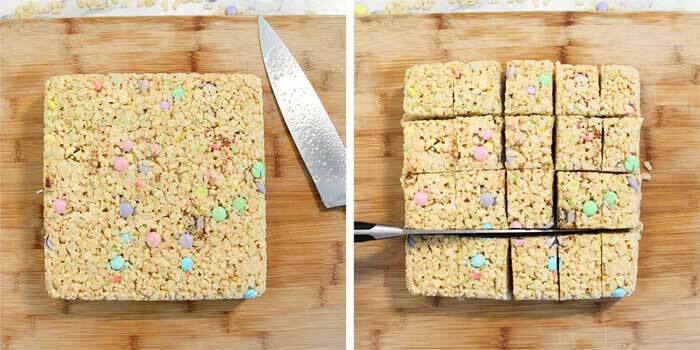 Pro-Tip: To make nice clean squares of lemonade rice krispies treats, spray sharp knife with nonstick spray. This will keep mixture from sticking to knife. Melt butter in large saucepan and add marshmallow. Stir continuously until completely melted then remove from heat. Add in lemon zest and lemon juice and mix thoroughly. Add candy and sprinkles and stir until combined. Immediately pour into prepared pan and spread evenly. Use hands, sprayed with a little nonstick spray to press down and even out. Sprinkle a few more sprinkles on top. Once cool, turn out of pan on to cutting board. Spray a knife with nonstick spray and cut into squares. 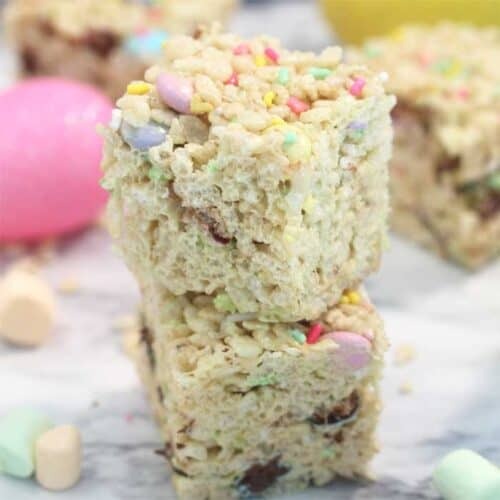 I love making these Rice Krispies Treats before Easter to add to the Easter baskets but they can also be made after Easter to use up some of the leftover candy. 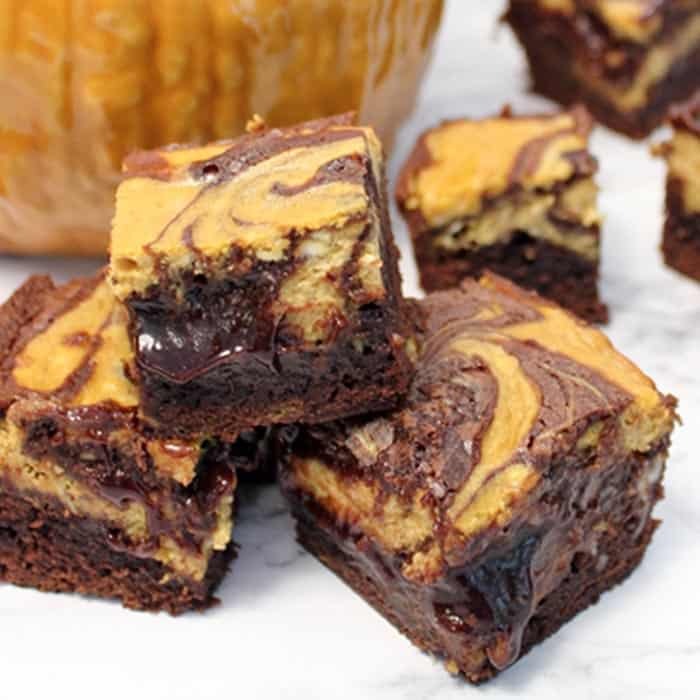 Whenever you decide to make them, better double the recipe because they’ll be gone before you know it. Love Easter sweets? Check out a few more below. 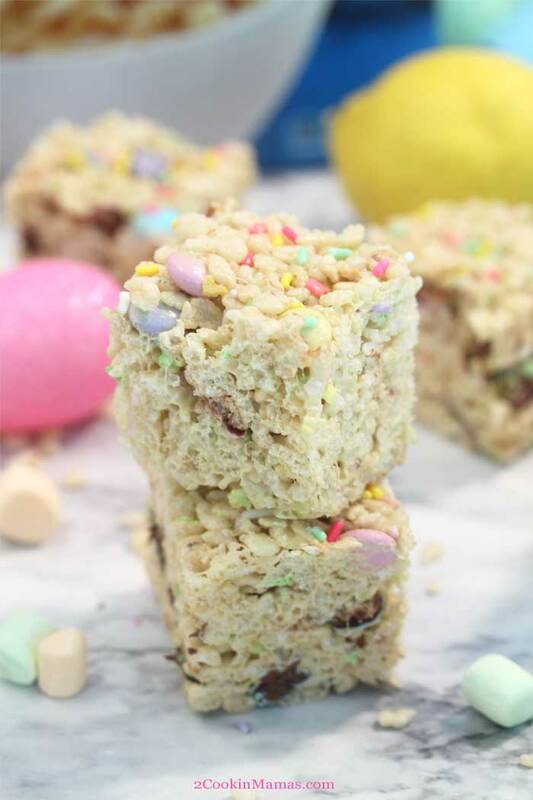 Sweet Lemonade Rice Krispies Treats are the classic favorite kids love but with a lemonade twist. 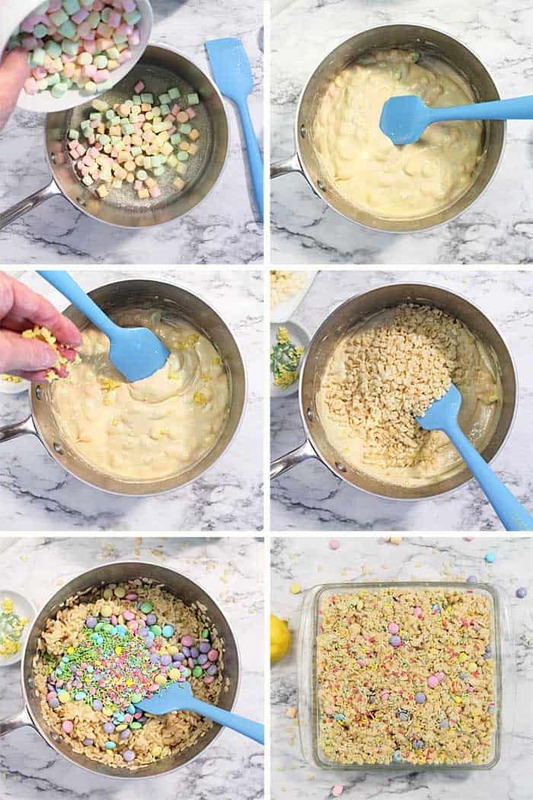 Add Easter sprinkles for a delicious holiday snack. 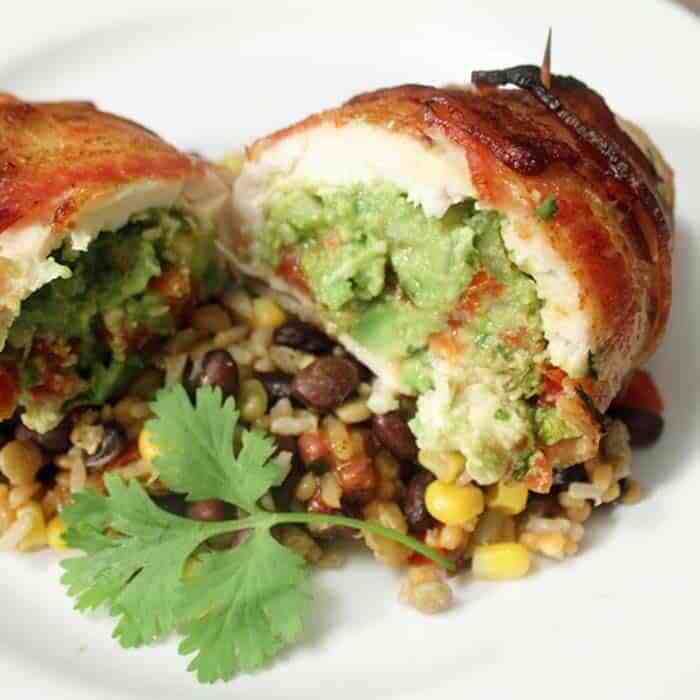 Prepare a 9x9-inch pan by spraying bottom and sides with nonstick spray. Add marshmallows and stir continuously until completely melted then remove from heat. Stir in lemon zest and lemon juice and mix thoroughly. Allow to cool completely. Cut and store wrapped in plastic. 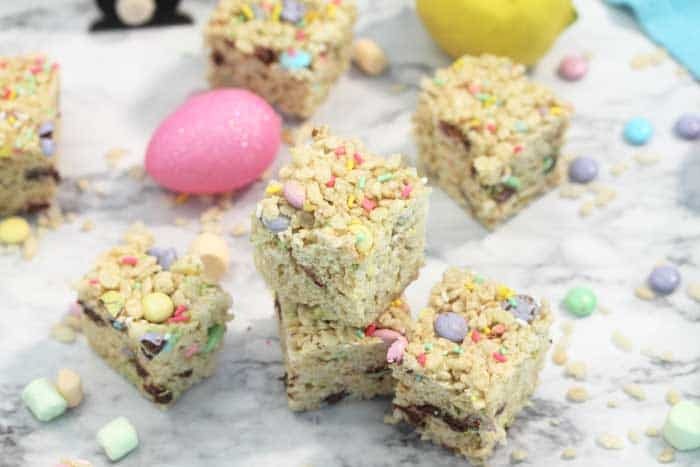 Love the lemon twist in these rice krispy treats. So good! The lemon just adds a bit more summer flavor to the mix. 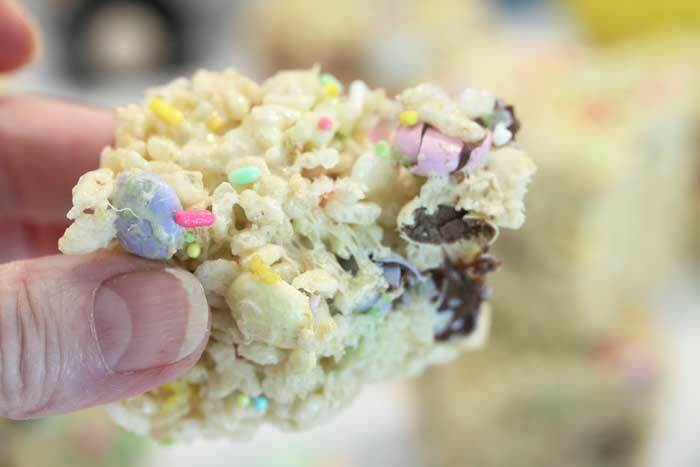 A really yummy twist on Rice Krispy treats. Our whole family gobbled them up. Yay! They went pretty fast in my house too!